Dr. Charles D. Ferguson, President of the Federation of American Scientists (FAS), is the course director for this summer’s CBRN Weapons: Science & Policy in the Summer Program in International Security. This course will run July 7-9. With more than twenty years’ experience in policy and national security, Dr. Ferguson has researched and written extensively on energy policy, nuclear nonproliferation, missile defense, and prevention of nuclear and radiological terrorism. His publications include 2011’s Nuclear Energy: What Everyone Needs to Know, The Four Faces of Nuclear Terrorism (with William Potter) in 2005, and the report Commercial Radioactive Sources: Surveying the Security Risks, which was the first in-depth, post-9/11 study of the “dirty bomb” threat. This report won the 2003 Robert S. Landauer Lecture Award from the Health Physics Society. 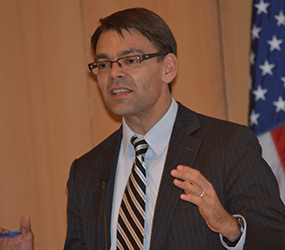 Dr. Ferguson has worked as the Philip D. Reed senior fellow for science and technology at the Council on Foreign Relations (CFR), consulted with Sandia National Laboratories and the National Nuclear Security Administration on improving the security of radioactive sources, and as a physical scientist in the Office of the Senior Coordinator for Nuclear Safety at the U.S. Department of State. He graduated with distinction from the United States Naval Academy, served in the U.S. Navy as a nuclear engineering officer, and earned a PhD in physics from Boston University. He has previously taught as an adjunct professor at Georgetown University and the Johns Hopkins University. Click here to register for CBRN Weapons: Science & Policy.